It's no big secret that most two way radios that are built specifically for the General Mobile Radio Service (GMRS) are not of the same quality as typical business radios. There's a good reason for this. Most people who are shopping for GMRS radios need a radio for occasional use, such as a camping trip, and simply prefer a lower priced radio that will get the job done. Occasionally, however, we have customers that need a business quality radio for use on GMRS. These customers typically use their radios often - not just for an occasional hike with the family. They are sometimes looking to become members of a local radio or repeater club, or are radio enthusiasts in general. Perhaps they've purchased "bubble pack" GMRS radios (as typical 2-pack consumer grade radios are sometimes called) in the past and are just looking for better range, better audio quality, or more durability. There is a reason that business quality radios sell for 6-10 times more than consumer grade radios - they're better. Whatever the reason, we often hear from a potential customer who is looking for a high quality GMRS radio. Most all programmable UHF business radios can be setup to work on the GMRS. This includes practically all 4 and 5 watt business radios that we sell, including models by Icom, Kenwood, Motorola, Olympia, and Vertex Standard. Business radios that are two watts and less typically wouldn't work, as they have a built-in list of frequencies that do not include GMRS. Is It Legal To Use A Business Radio For GMRS? It is not entirely clear if it is legal to use a business radio for GMRS. Business radios that would be programmable to GMRS are going to be Part 90 type accepted (certified). This basically means that the FCC has found them to conform to the "Part 90" rules, which relate to land mobile or business radios. Every station in a GMRS system must use transmitters the FCC has certificated for use in the GMRS. Write to any FCC Field Office to find out if a particular transmitter has been certificated for the GMRS. All station equipment in a GMRS system must comply with the technical rules in part 95. We have never been made aware of anyone having a legal issue using a Part 90 radio for GMRS, and we will program a business radio for GMRS at a customer's request. Please understand, however, that the operator of the radio is ultimately responsible for using the device in compliance with the FCC regulations. For an in-depth discussion on this topic, listen to The Two Way Radio Show TWRS-38 - Using Business Radios on the GMRS. This entry was posted in General, Two Way Radios, Articles, Business Radios, Consumer Radios, Kenwood and tagged radio, Business, GMRS, frequencies on June 8, 2012 by Rick. In this episode we discuss the the FCC's new 2013 narrowbanding requirement and what it means for users of business two way radios. We talk about the FCC's 2013 narrowbanding mandate. We will clarify what this means, help you determine if this mandate will impact your business, and if so how to move forward. 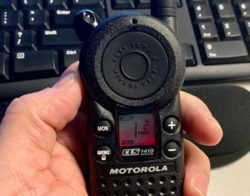 For more information about the new FCC requirement, read A Summary of the FCC's Proposed Changes to GMRS and Other Services in the Two Way Radio Blog. Today we will review the Olympia P324 business radio. This entry was posted in Two Way Radio Show Podcast and tagged twoway, two, way, radio, radios, UHF, VHF, 2way, communications, FRS, GMRS, handheld, portable, mobile, walkie, talkies, talkie, channels, road, Olympia, P324, P324R, FCC, narrowband, narrowbanding, wideband, frequency, frequencies, January, 2013 on May 9, 2011 by Rick.